In 1969 Edmund Wilson (who by then had already written 22 books), penned an eloquent portrait of David Flusser when he recounted his conversations with Flusser in his “The Dead Sea Scrolls 1947-1969” (London: W. H. Allen, 1969). Here are a few excerpts from Wilson’s book. January 2009 marked the 25th anniversary of The Center for Judaic-Christian Studies. In the following interview, the Center’s founder, Dwight Pryor, surveys his life’s journey, and reflects on the dangers inherent in the “Jewish Roots” movement. Dwight’s words are a clarion call to those who are part of this renewal, and a sobering warning to those who would abuse the fledgling movement. You may have received a letter from her. Or maybe you met her at a conference or workshop. 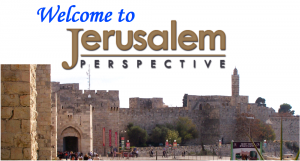 In one way or another, she has had a part in your connection with Jerusalem Perspective. Her name is Barbara Chambers and she has been our office administrator since the end of 1994.